In February 2017, Grandview voters approved a bond measure to replace Grandview High School with a new school and on Wednesday, Sept. 5, the Grandview School District will officially break ground on construction of the new school. Community members are invited to the groundbreaking ceremony, which will take place at 1:30 p.m. on Wednesday, Sept. 5, on the grounds of Grandview High School. To get to the groundbreaking, please park on West Second Street, just west of Rich Leenhouts Stadium. Then walk up to the back of the current high school, between the west end of the stadium and the east end of the baseball field. There will be signs to help people get to the site. The groundbreaking marks an exciting project for the Grandview School District. The new high school will be two stories, and include two gyms and an auditorium, as well as state-of-the-art classrooms. District officials, along with the project architect, have been hard at work since the ballot measure passed in 2017. They’ve been working to make sure the new building will fit the needs of Grandview students for years to come. 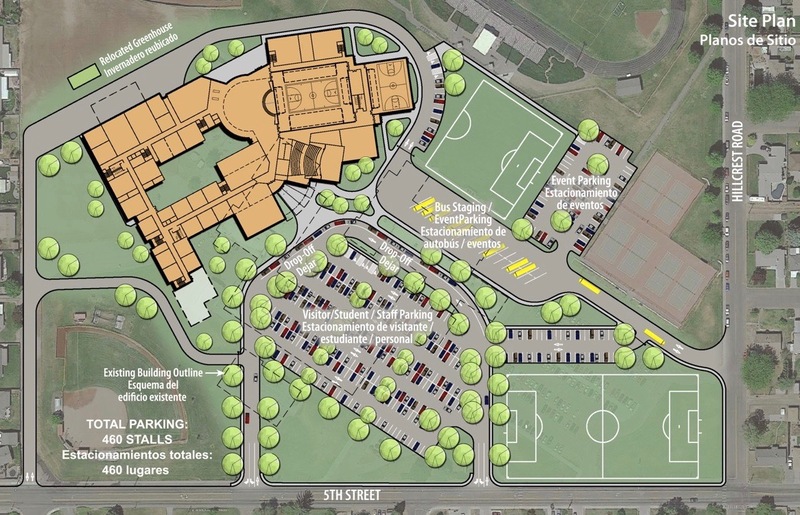 Construction of the new high school is estimated to take two and a half years, with students expected to enter the new building in the fall of 2020, with final construction – including landscaping and parking lots – being completed sometime in 2021. En febrero de 2017, los votantes de Grandview aprobaron una medida de bonos para reemplazar a Grandview High School con una nueva escuela y el miércoles 5 de septiembre, el Distrito Escolar de Grandview comenzará oficialmente la construcción de la nueva escuela. Los miembros de la comunidad están invitados a la ceremonia de inauguración, que tendrá lugar a la 1:30 p.m. el miércoles, 5 de septiembre, en los terrenos de Grandview High School. Para llegar a la inauguración, estacione en West Second Street, justo al oeste del estadio Rich Leenhouts. Luego camine hacia la parte posterior de la escuela secundaria actual, entre el extremo oeste del estadio y el extremo este del campo de béisbol. Habrá letreros para ayudar a las personas a llegar al sitio. El pionero marca un proyecto emocionante para el Distrito Escolar de Grandview. La nueva escuela secundaria tendrá dos pisos e incluirá dos gimnasios y un auditorio, además de aulas de última generación. Los funcionarios del distrito, junto con el arquitecto del proyecto, han estado trabajando duro desde que se aprobó la medida en el año 2017. Han estado trabajando para asegurarse de que el nuevo edificio se adapte a las necesidades de los estudiantes de Grandview en los próximos años. Se estima que la construcción de la nueva escuela secundaria tomará dos años y medio, y se espera que los estudiantes ingresen al nuevo edificio en el otoño de 2020, y que la construcción final -incluidos el paisajismo y los estacionamientos- se complete en algún momento en 2021. School has started for the new year and so has prep for construction of the new Grandview High School. Today, Thursday, Aug. 30, crews were hard at work demolishing the back wall of the 300 hall at GHS - also known as the metal, wood and auto shops. The classes are all moving to the newly renovated Grandview High School Tri-Plex building at 1107 W. Second St. Other classrooms in the 300 hall are unaffected by the demolition, which helps make way for the construction of what will be the new entrance to the new Grandview High School. La escuela ha comenzado para el nuevo año y también la preparación para la construcción de la nueva Grandview High School. Hoy, jueves 30 de agosto, las cuadrillas trabajaron duro para demoler la pared trasera de la sala 300 en GHS, también conocida como metal, madera y tiendas de autos. Las clases se están mudando al recientemente renovado edificio Tri-Plex Grandview High School en 1107 W. Second St. Otras aulas en la sala 300 no se ven afectadas por la demolición, lo que ayuda a dar paso a la construcción de lo que será la nueva entrada a la nueva Grandview High School. The construction of a new Grandview High School took a major step forward on Friday, Aug. 3, when the Grandview School Board approved awarding the contract for the project to Fowler General Construction. During a special meeting held on Friday afternoon, the school board unanimously approved awarding the construction contract to the Richland company, which was one of three general contractors who bid for the project. Heath Gardner, senior project manager for the Wenaha Group, who is overseeing the construction project, told the board that once they approved the contract, he would start working on the necessary paperwork and he hoped to see dirt start moving on the site before the end of August. “It looks like we’re ready to build a new school,” said Board Chair Dale Burgeson. Gardner said the bid opening was done on Thursday evening and he was happy to see that the bids were coming in under budget. “We had a fantastic night last night,” Gardner said. It was estimated the construction cost of the high school, not including design work, furniture or the relocation of the wood and metal shop, would be just under $54 million. The board awarded the contract to Fowler for just under $53.7 million, not including tax. Gardner explained that the project team had bid out the project with 16 alternates, of which 14 would have been things that would been removed from the project to save costs. Because the bids came in favorably, all 16 alternates are part of the project. Nothing had to be removed, changed or reworked. The new high school will include everything from a second auxiliary gym to an auditorium to state-of-the-art classrooms. “We have an exciting time coming up over the next two years,” Burgeson said. Superintendent Henry Strom said he’s happy the bids came in favorably and that the district is going to be able to deliver the type of building the community expects and deserves. Burgeson said he’s lived in the community for more than 45 years and doesn’t remember another time the community came together so fully to support something, like they did when they approved the 2017 bond measure. “We need to give a big thank you to the community,” Burgeson said. An official groundbreaking for the project is expected to happen sometime in early September. District accepting bids for construction of the New Grandview High School. Sealed bids will be received by the Board of Directors of Grandview School District, in the Superintendents’ Office on the second floor at 913 W. 2nd Street, Grandview, WA 98930, for the construction of the New Grandview High School. Sealed base bids must be received by 6 p.m. on Thursday, August 2. Project documents are available at www.architectswestplans.com. A mandatory Pre-Bid Conference has been scheduled for 10 a.m. on Wednesday, July 11, in the library at Grandview High School. The Grandview School District reserves the right to reject any or all bids and to waive informalities or irregularities in any bid. Click here for full bid specifications document. Every two weeks a group of administrators and staff members meet with representatives from Architects West and our construction manager from Wenaha Construction to continue work on the Grandview High School construction project. The project is on track with construction expected to begin in August. During second quarter, the group has been focused on nailing down the details for special use areas of the school – from the locker rooms to the auditorium. The group has been making decisions on the infrastructure for the auditorium. GHS Principal Kim Casey, who has been a member of the construction group since the beginning of the project, said they’ve discussed everything from the specifications of the stage curtain to the sound system and the acoustics for the performance hall. Casey said they’ve also ironed out the details for the band and choir rooms that are located behind the auditorium. They’ve looked at how the band and choir rooms could be used in conjunction with the auditorium, as far as stage access and dressing rooms are concerned. They’ve also worked to determine how much storage will be needed in the band room, what the acoustics need to be for both the band and choir room, and how many practice rooms will be needed between the two rooms. When it comes to athletics, Casey said the group has been focusing on locker room functionality. She said the locker room area, adjacent to the two gyms, will have a drying room for football pads and helmets, a training room and a special room for referees. She said the planned boy’s and girl’s locker rooms will also have the ability to be split from the two larger locker rooms to four smaller, but fully functioning, locker rooms. This functionality will be useful when more than two teams are playing at a time, especially during basketball season when boys and girls games regularly overlap. Casey said as the high school project continues her next area of focus is fixtures and furniture. They’ll be making decisions on everything from tables and chairs to dry erase boards. Cada dos semanas un grupo de administradores y miembros del personal se reúnen con representantes de Architects West y nuestro gerente de construcción de Wenaha Construction para continuar trabajando el proyecto de construcción de nuestra escuela secundaria Grandview High School. El proyecto de construcción va como planeado y esperamos comenzar en agosto. Durante el segundo cuaderno el grupo se ha enfocado en terminar los detalles para áreas de uso especial de la escuela- de los cuartos de vestuario al auditorio. El grupo está haciendo decisiones en la infraestructura para el auditorio. La directora de GHS Kim Casey, que ha sido miembra del grupo de construcción desde el principio del Proyecto, dijo que han hablado sobre todo desde las especificaciones de la cortina del escenario hasta el Sistema de sonido y las acústicas para el salón de actuaciones. Casey dijo que también han resuelto los detalles para los cuartos de la banda y coro que están localizados detrás del auditorio. Han analizado como se pueden utilizar los cuartos del coro y banda en conjunto con el auditorio, en lo que se refiere al acceso a la plataforma y los vestuarios. También han trabajado para determinar cuánto almacenaje será necesario para el salón de la banda, cuales serán las acústicas necesarias para la banda y el coro, y cuantos cuartos de práctica se ocuparan entre los dos salones. Cuando se trata de atletismo, Casey dijo que el grupo se ha enfocado en la funcionalidad de los vestuarios. Dijo que el área del vestuario, junto a los dos gimnasios, tendrá un cuarto para secar los cojines de futbol y los cascos, un cuarto para entrenar y un cuarto especial para los árbitros. Ella dijo que los vestuarios planeados para los hombres y mujeres también tendrán la capacidad de dividirse de dos cuartos grandes a cuatro más pequeños, pero completamente funcionales. Esta función será útil cuando haiga más de dos equipos jugando al mismo tiempo, especialmente durante la temporada de baloncesto cuando los juegos de hombres y mujeres regularmente coinciden. Casey dijo que al continuar el proyecto de la escuela sus siguientes áreas de enfoque son los accesorios y muebles. Estarán haciendo decisiones sobre todo, desde mesas a sillas a pizarrones. People in the district have been hard at work since the bond measure for the new high school passed in February. Every week administrators and staff members meet with architects and the district's construction manager to work out different details – how many bathrooms the school needs, where they will be placed, how student traffic will flow into the cafeteria, what kind of door locks will be needed where, how large STEM classrooms will be, where locker rooms will be placed, how many seats will be in the auditorium. All of these questions have been looked at, discussed and examined in detail. And more than that, everyone is working to ensure the new school is aligned to state standards. That means everyone is making sure there is enough room for our students, that the instructional space is conducive to learning and that every space is put to good use. “We’ve talked a lot about design and the about the footprint of the classrooms,” said Superintendent Henry Strom. Planning talks have also turned to value. It’s important to the district that the money being spent on the new school is spent as purposefully as possible. Assistant Superintendent of Finance and Operations Brad Shreeve said the district has also put the project through a value engineering process. During the process the project is presented to an independent firm who looks at the plan and questions costs, expenses and use of district resources. Value engineering is required by the state on school construction projects. A few of those decisions have had to do with the shape of the building itself. Originally the schematics called for the two wings that will house classrooms to run parallel to each other. The new schematics show the south wing now angles in to meet the north wing, creating a more triangular courtyard. The change was made to account for the site’s topography. The site where the south wing was originally slated to be built, had a steep slope to it, which would have meant more dirt moving and ultimately a higher cost of construction. Angling the wing back is more cost effective, does not result in any lost classroom space and creates more room for much needed parking. Another change is the reduction of seating capacity in the auditorium. The auditorium will now seat 452 people, which is slightly smaller than originally planned. The change will help save money and allocate more space for classrooms. The other major change to the original schematic is a change in how the second gym is oriented. The second gym was originally planned to have a north-south orientation, but that has been changed to an east-west orientation, which will allow for more storage room. All in all, Shreeve and Strom said the new high school will be just under 200,000 square feet. As for how the project is coming, Shreeve and Strom said the project is on track. The construction manager, Heath Gardner with the Wenaha Group, and Architects West are following a strict timeline to keep the project on schedule. The project is currently in its final phases of design development and construction documents will soon begin to come together. Certain forms and permits are being submitted, including the SEPA review and the Hazmat Survey and Report. Construction on the project is set to being in August 2018. It is estimated that students should occupy the building by December 2020, with a final completion date of Spring 2021. The only thing that could possibly affect the district’s construction schedule is whether or not the state legislature is able to pass a state budget. If a budget isn’t passed in a timely manner, the matching funds needed for the construction project could be delayed. As things currently stand the project is on schedule and today’s sixth graders would enter the new school in winter 2020 and today’s fifth graders will be the first class to spend an entire school year in the new school, starting high school in 2021. La gente en el distrito ha estado trabajando duro desde que la medida de bonos para la nueva escuela secundaria pasó en febrero. Cada semana los administradores y el personal se reúnen con arquitectos y el gerente de construcción del distrito para resolver diferentes detalles: cuántos baños necesita la escuela, dónde se colocarán, cómo fluirá el flujo de estudiantes hacia la cafetería, qué tipo de cerraduras serán necesarias. dónde, qué tan grandes serán las aulas de STEM, dónde se colocarán los vestidores, cuántos asientos habrá en el auditorio. Todas estas preguntas han sido examinadas, discutidas y examinadas en detalle. Y más que eso, todos están trabajando para asegurar que la nueva escuela esté alineada con los estándares estatales. Eso significa que todos se aseguran de que haya suficiente espacio para nuestros estudiantes, que el espacio de instrucción sea propicio para el aprendizaje y que cada espacio se aproveche. "Hemos hablado mucho sobre diseño y la huella de las aulas", dijo el Superintendente Henry Strom. Las conversaciones de planificación también han cambiado a valor. Es importante para el distrito que el dinero que se gasta en la nueva escuela se gaste con el mayor propósito posible. El Asistente del Superintendente de Finanzas y Operaciones, Brad Shreeve, dijo que el distrito también ha llevado el proyecto a través de un proceso de ingeniería de valor. Durante el proceso, el proyecto se presenta a una firma independiente que analiza el plan y cuestiona los costos, los gastos y el uso de los recursos del distrito. La ingeniería de valores es requerida por el estado en los proyectos de construcción de escuelas. "No pudieron encontrar ningún reajuste importante que tuviera que hacerse", dijo Shreeve. "Dijeron que todas las decisiones tomadas han sido responsables". Algunas de esas decisiones han tenido que ver con la forma del edificio en sí. Originalmente, los esquemas requerían las dos alas que alojarían las aulas para que corrieran paralelas entre sí. Los nuevos esquemas muestran que el ala sur ahora forma ángulos para encontrarse con el ala norte, creando un patio más triangular. El cambio se realizó para tener en cuenta la topografía del sitio. El sitio donde originalmente se planeaba construir el ala sur tenía una pendiente pronunciada, lo que habría significado más movimiento de tierra y, en última instancia, un mayor costo de construcción. Inclinar el ala hacia atrás es más rentable, no genera pérdida de espacio en el aula y crea más espacio para el estacionamiento que tanto se necesita. Otro cambio es la reducción de la capacidad de asientos en el auditorio. El auditorio tendrá capacidad para 420 personas, lo que es un poco más pequeño de lo planeado originalmente. El cambio ayudará a ahorrar dinero y a asignar más espacio para las aulas. El otro cambio importante en el esquema original es un cambio en la orientación del segundo gimnasio. El segundo gimnasio se planeó originalmente para tener una orientación norte-sur, pero se ha cambiado a una orientación este-oeste, lo que permitirá más espacio de almacenamiento. Con todo, Shreeve y Strom dijeron que la nueva escuela secundaria tendrá poco menos de 200,000 pies cuadrados. En cuanto a cómo se desarrollará el proyecto, Shreeve y Strom dijeron que el proyecto está en camino. El gerente de construcción, Heath Gardner con el Grupo Wenaha, y los arquitectos West están siguiendo un cronograma estricto para mantener el proyecto dentro del cronograma. El proyecto se encuentra actualmente en su fase final de desarrollo del diseño y los documentos de construcción pronto comenzarán a unirse. Se están enviando ciertos formularios y permisos, incluida la revisión de SEPA y la Encuesta y el Informe de materiales peligrosos. La construcción del proyecto está programada para agosto de 2018. Se estima que los estudiantes deben ocupar el edificio para diciembre de 2020, con una fecha de finalización final de la primavera de 2021. Lo único que podría afectar el cronograma de construcción del distrito es si la legislatura estatal puede o no aprobar un presupuesto estatal. Si no se aprueba un presupuesto de manera oportuna, los fondos de contrapartida necesarios para el proyecto de construcción podrían retrasarse. Tal como están las cosas actualmente, el proyecto está dentro del cronograma y los estudiantes de sexto grado ingresarían a la nueva escuela en el invierno de 2020 y los alumnos de quinto grado de hoy serán la primera clase en pasar un año escolar completo en la nueva escuela, comenzando la escuela secundaria en 2021. Since late 2015, the Grandview School District has been working on continuous improvement measures. More than a year ago the district hired a consulting firm to conduct community outreach services and key stakeholder interviews to determine what areas people in the community felt the district could work to improve. One of the reoccurring items was a need for improvements at Grandview High School. Six months ago the district formed a facilities advisory team, a group made up of community members and district staff, to work on determining what kind of upgrades were needed at GHS. The group took into account the evolution of high school programs, including the dedicated space needed for STEM classes. The group also looked at how to address security concerns and the needs of the community. An architect team and construction manager then collaborated with the facility advisory team to come up with various options and concepts that would meet the determined needs for Grandview High School. After a lot of discussion and consideration the facilities advisory team determined the most efficient and fiscally conservative path would be to look at building a new school directly behind the current high school. On Tuesday, Dec. 13, the Grandview School Board approved a resolution to bring a school replacement bond to voters. The approximately $42 million bond measure will be on the Feb. 14 ballot. Below are a number of frequently asked questions in English and Spanish regarding the proposed Grandview High School project. If you have any questions about the project or would like to invite district officials to talk to your group please email the district at ProjectGHS@gsd200.org. Desde finales de 2015, el Distrito Escolar de Grandview ha estado trabajando en medidas de mejora continua. Hace más de un año, el distrito contrató una firma de consultoría para llevar a cabo servicios de alcance comunitario y entrevistas con las principales partes interesadas para determinar qué áreas las personas en la comunidad creían que el distrito podría mejorar. Uno de los temas recurrentes fue una necesidad de mejoras en Grandview High School. Hace seis meses, el distrito formó un equipo asesor de instalaciones, un grupo formado por miembros de la comunidad y personal del distrito, para determinar qué tipo de mejoras se necesitaban en el SGA. El grupo tomó en cuenta la evolución de los programas de la escuela secundaria, incluyendo el espacio dedicado necesario para las clases de STEM. El grupo también analizó cómo abordar las preocupaciones de seguridad y las necesidades de la comunidad. Un equipo de arquitecto y gerente de construcción luego colaboraron con el equipo de asesoría de la instalación para presentar varias opciones y conceptos que podrían satisfacer las necesidades determinadas de la Escuela Preparatoria Grandview. Después de una gran cantidad de discusión y consideración el equipo asesor de las instalaciones determinó el camino más eficiente y fiscalmente conservador sería mirar a construir una nueva escuela directamente detrás de la escuela secundaria actual. El martes, 13 de diciembre, la Junta Escolar de Grandview aprobó una resolución para traer un bono de reemplazo de la escuela a los votantes. La medida de bonos de aproximadamente $42 millones estará en la papeleta del 14 de febrero. A continuación se presentan una serie de preguntas frecuentes en inglés y español sobre el proyecto propuesto de la Escuela Preparatoria Grandview. Si tiene alguna pregunta sobre el proyecto o desea invitar a los funcionarios del distrito a hablar con su grupo, envíe un correo electrónico al distrito en ProjectGHS@gsd200.org. Are you planning on remodeling the current high school or building a brand new school? We are looking at building a new school. More than a year ago we hired a consulting firm to conduct community outreach services and key stakeholder interviews to determine what areas people in the community felt the district could work to improve. From that work, the district found one of the areas that kept coming up was facilities, and more specifically people’s desire to see Grandview High School either upgraded or a new high school built. For the last six months the Facilities Advisory Team, a group made up of community members and district staff, has been working to determine what kind of upgrades are needed, what facilities the community would like to see added to the school and what the school’s program needs are when it comes to facilities. An architect team and construction manager collaborated with the facility advisory team to help determine the best option for a new high school plan. A new school would mean the current high school could remain open during construction - the new high school would be built on the existing site, directly behind where the school sits now. This plan is more cost effective than a modernization, will take less time and will cause less disruption to student learning than a remodel project. A modernization project would call for working around students, a need for additional portables to house students during the project and it would extend the project by one year – all of which adds up to larger costs. We found that new school construction is more cost efficient than trying to a remodel or modernize our current high school. New construction is estimated to cost between 10 and 15 percent less than a modernization. Why does Grandview need a new high school? The current high school was completed and occupied in 1978, and was built to house approximately 500 students. As of October 2016, there are 950 students attending classes at Grandview High School. Without more space added to the high school, we will have to continue to bring in portables to meet our classroom needs. A new school will also mean a more secure school – a building with controlled points of entry and hallways that can easily be surveyed. It will also give us a chance to build in modern infrastructure to support new technologies, increase our electrical capacity and better meet our students’ needs. The new school will be approximately 180,000 square feet and accommodate around 1,150 students. The proposed concept also includes two gyms, which allows for more efficient access for girls and boys sports, as well as for use by community groups. What would a new school mean for students and the community? The new school would mean added space for programs like STEM (Science, Technology, Engineering and Math) and CTE or vocational classes. This would give students the resources they need for classes ranging from sports medicine and robotics to aeronautical engineering and metals shop. The new building would also have space dedicated to two gyms, which could be used by community organizations ranging from AAU to afterschool programs and an auditorium, where the Grandview High School Drama Club could stage productions, as well as other community organizations including community theater groups, groups bringing in speakers or for other community events. Why are you building a two-story high school? A two-story building is the concept being proposed because it makes the most of the space we already have available on the current high school campus. A smaller footprint also makes for a more secure building, and will allow for much-needed parking to be included in the plan. The current high school parking lot does not have enough space to meet daily needs, and does not provide adequate space for buses. The new concept provides additional space for parking, creates a dedicated space for buses and includes parking that will be close to the football stadium, making it easier for community members to get to the games. The two-story layout will include an elevator to meet the needs of students and staff. At this point it’s estimated the project will take four years to go from bond measure to a finished school. Planning and permitting is estimated to take one year, while actual construction will likely take two and half years. That means if voters approve a school construction bond in February or April of 2017, then planning, permits and state approval will likely take from April 2017 to July 2018, with construction beginning in August or September 2018. It is estimated that students could occupy the building by December 2020, with a final completion date of Spring 2021. We’re still in the initial stages of planning this project. Our current estimates put this project at approximately $70 million, of which an estimated $27 million would come from the state. The remaining $42 million would be paid for with the help of a bond measure, and would translate into a tax rate in the range of $3.65 per $1,000 of assessed value or an increase of around 47 cents per $1,000 over the current tax rate of $3.18 per $1,000. That means the owner of a $150,000 house would pay around $70 a year over what they’re currently paying, or for less than the cost of one large espresso drink every month, they would have a new high school. We also want everyone to know that the bonds currently being paid by taxpayers will be paid off before the new bond would be collected. The new measure will replace the old bonds, which will be paid off in 2018. ¿Está planeando remodelar la actual escuela secundaria o construir una nueva escuela? Estamos buscando edificar una nueva escuela. Hace más de un año contratamos a una empresa de consultoría para llevar a cabo los servicios de extensión a la comunidad y entrevistas de interés clave para determinar qué áreas las personas en la comunidad creía que el distrito podría mejorar. De ese trabajo, el distrito encontró que una de las áreas que seguían apareciendo eran las instalaciones y, más específicamente, el deseo de la gente de ver a la Escuela Preparatoria de Grandview, ya sea mejorada o construida una nueva escuela secundaria. Durante los últimos seis meses, el Comité Asesor de Instalaciones, un grupo formado por miembros de la comunidad y personal del distrito, ha estado trabajando para determinar qué tipo de mejoras son necesarias, qué facilidades la comunidad desea que se agreguen a la escuela y lo que el programa de la escuela necesita Son cuando se trata de instalaciones. Un equipo de arquitectos y el gerente de construcción colaboraron con el comité asesor de instalaciones para ayudar a determinar la mejor opción para un plan de una nueva secundaria. Una nueva escuela significaría que la escuela secundaria actual podría permanecer abierta durante la construcción - la nueva escuela secundaria se construiría en el sitio existente, justo detrás de donde se encuentra la escuela ahora. Este plan es más rentable que una modernización, tomará menos tiempo y causará menos interrupción al aprendizaje de los estudiantes que un proyecto de remodelación. Un proyecto de modernización exigiría trabajar en torno a los estudiantes, la necesidad de portátiles adicionales para alojar a los estudiantes durante el proyecto y extendería el proyecto en un año, todo lo cual suma mayores costos. Encontramos que la construcción de una nueva escuela es más rentable que tratar de remodelar o modernizar nuestra actual escuela secundaria. Se estima que la nueva construcción costará entre un 10 y un 15 por ciento menos que una modernización. ¿Por qué Grandview necesita una nueva preparatoria? La escuela secundaria actual fue terminada y ocupada en 1978, y fue construida para albergar a aproximadamente 500 estudiantes. A partir de octubre de 2016, hay 950 estudiantes asistiendo a clases en la Escuela Preparatoria Grandview. Sin más espacio añadido a la escuela secundaria, tendremos que seguir trayendo portátiles para satisfacer las necesidades de nuestra clase. Una nueva escuela también significará una escuela más segura - un edificio con los puntos de entrada controlados y los pasillos que pueden ser examinados fácilmente. También nos dará la oportunidad de construir infraestructura moderna para apoyar nuevas tecnologías, aumentar nuestra capacidad eléctrica y satisfacer mejor las necesidades de nuestros estudiantes. La nueva escuela tendrá aproximadamente 180,000 pies cuadrados y acomodara a alrededor de 1,150 estudiantes. El concepto propuesto también incluye dos gimnasios que permiten un acceso más eficiente para los deportes de las muchachas y los muchachos así como para el uso por grupos de la comunidad. ¿Qué significaría una nueva escuela para los estudiantes y la comunidad? La nueva escuela significaría un espacio adicional para programas como STEM (Ciencia, Tecnología, Ingeniería y Matemáticas) y CTE o clases vocacionales. Esto daría a los estudiantes los recursos que necesitan para clases que van desde la medicina deportiva y la robótica hasta la ingeniería aeronáutica y la clase de metales. El nuevo edificio también tendría espacio dedicado a dos gimnasios, que podrían ser utilizados por organizaciones comunitarias que van desde AAU a programas después de clases y un auditorio, donde el Club de Teatro de la Escuela Preparatoria de Grandview podría realizar producciones, así como otras organizaciones comunitarias incluyendo grupos de teatro comunitario, Grupos que traen a los oradores o para otros eventos de la comunidad. ¿Por qué está construyendo una escuela secundaria de dos pisos? Un edificio de dos pisos es el concepto propuesto porque aprovecha al máximo el espacio que ya tenemos disponible en el actual plantel escolar. Una huella más pequeña también hace para un edificio más seguro, es más rentable construir y permitirá el estacionamiento añadido muy necesario ser incluido en el plan. El estacionamiento actual de la escuela secundaria no tiene suficiente espacio para satisfacer las necesidades diarias, y no proporciona espacio suficiente para los autobuses. El nuevo concepto proporciona espacio adicional para el estacionamiento, crea un espacio dedicado para los autobuses e incluye plazas de aparcamiento que estarán cerca del estadio de fútbol, facilitando a los miembros de la comunidad llegar a los juegos. El diseño de dos pisos incluirá un ascensor para satisfacer las necesidades de los estudiantes y el personal. ¿Cuánto tiempo se tardará en construir? En este punto se estima que el proyecto tomará cuatro años para pasar de la medida de bonos a una escuela terminada. Se estima que la planificación y los permisos toman un año, mientras que la construcción real probablemente se llevará dos años y medio. Esto significa que si los votantes aprueban un bono de construcción de escuelas en febrero o abril de 2017, la planificación, los permisos y la aprobación estatal probablemente tomarán entre abril de 2017 y julio de 2018, y la construcción comenzará en agosto o septiembre de 2018. Se estima que los estudiantes podrían ocupar el edificio para diciembre de 2020 con una fecha de terminación final de primavera de 2021. Todavía estamos en las etapas iniciales de la planificación de este proyecto. Nuestras estimaciones actuales sitúan este proyecto en aproximadamente 70 millones de dólares, de los cuales unos 27 millones provendrían del estado. Los restantes $ 42 millones serían pagados con la ayuda de una medida de bonos y se traduciría en una tasa de impuesto en el rango de $ 3.65 por $ 1.000 de valor accesible o un aumento de alrededor de 47 centavos por $ 1.000 sobre la tasa impositiva actual de $ 3.18 por $ 1,000. Eso significa que el dueño de una casa de $ 150,000 pagaría alrededor de $ 70 al año por lo que están pagando actualmente, o por menos que el costo de una bebida grande de espresso cada mes, tendrían una nueva escuela secundaria. También queremos que todos sepan que los bonos actualmente pagados por los contribuyentes serán pagados antes de que el nuevo bono sea cobrado. La nueva medida sustituirá a los viejos bonos que se pagarán en 2018.